Crystal Peacock: This kettle-soured Berliner Weisse pours hazy straw yellow with a stark white foam. Aromas of lemon rind, pineapple, and tart grapefruit complement the pleasant malty wheat flavor. A combined fermentation from ale yeast as well as the souring Lactobacillus give it a quenching tartness, light body, and crisp finish. 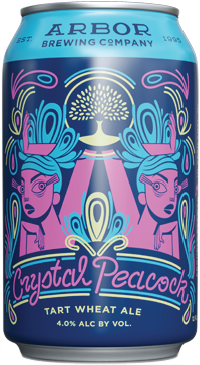 Crystal Peacock is our pride beer and we’re proud to say... whoever you love, Arbor loves you!